Plants that sprout new leaves or flowers in the spring are a true pleasure to have in the garden, creating a vibrant, noticeable change between the seasons. There are many plants to grow in the spring that will add color and texture to the garden, and many spring-flowering plants will continue on well into the summer. Also known as sword lily, the gladiolus (Gladiolus x hortulanus) is a classic spring-blooming flower that produces its blooms from early spring until the end of summer. The perennial flower boasts an upright, fleshy stalk accented by floppy, silky flowers in colors ranging from pale yellow to purple, red and pink, depending on the cultivar. The plant grows in a wide range of climates and will survive in USDA zones 3a to 11a. Gladiolus are excellent for borders or specimen plants, and these highly water tolerant plants are ideal for pond edges or waterlogged soils. 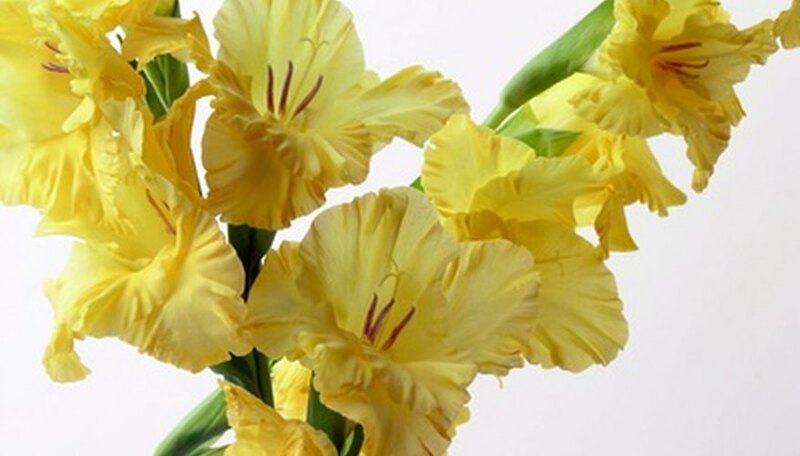 Adaptable to many soil types, gladiolus plants will produce their best blooms with full sunlight. Delicate and understated, the lily of the valley (Convallaria majalis) is a spring-blooming, low-growing plant that rarely reaches heights of over a foot. The plant sports waxy, crisp green foliage and arching columns of sweetly fragrant, bell-shaped flowers, which are usually white. The plant does best in cooler climates and will thrive in USDA zones 2b to 7b, in either partial shade or filtered sunlight. Lily of the valley is adaptable to different soil types, though a neutral, well-draining soil is ideal. Water the plant frequently so that the soil near the base of the plant is slightly moist to the touch. Low-maintenance and easy to grow, pink evening primrose (Oenothera speciosa) is a lovely perennial native to the South Central United States. The plant has bushy, thick green leaves topped with pale pink, roselike flowers. The plant produces its fragrant flowers in mid- to late spring. Pink evening primrose is best suited for USDA zones 5 to 9, and the plant will thrive in full sun locations, even in high humidity. Adaptable to different soils types, the plant is drought tolerant and requires little care. The flower is invasive in some areas, so check an invasive plant list for your community before cultivating pink evening primrose.